Check in: Once the online booking is made you will receive a booking confirmation email with all the necessary information for your stay. The check in takes place from 2pm onwards on the day of arrival. Prior arrangements need to be made, guests are kindly requested to inform the camp reception of their estimated time of arrival. Please phone the camp reception 30 minutes prior to arrival. This way you are ensured that the check in can be arranged without delays. You will find the telephone number in the bookings confirmation email. Check out – before 10am on day of departure. AfriCamps reserves the right, at all times – without statement of reasons – to cancel a booking within 48 hours. AfriCamps will confirm the booking via e-mail. The confirmation and invoice must be checked immediately on receipt for any errors. Possible or claimed inadequacies must always be notified by email or phone within 48 hours following the date of the confirmation/invoice and in any case before the start of the stay. Please note that all the rates advertised online and as well as offline are just a price indication and not binding. AfriCamps reserves the right to modify the prices at all times. Use our online bookings calendar on www.africamps.com to check current rates and availability. – Wood and firelighters for the wood-stove and campfires (for sale at farm). Most of our camps do not allow pets on their property. If you wish to take your pet on holiday, please obtain the prior consent of AfriCamps. Where pets are allowed, a maximum of one pet per tent is applicable. At the time of arrival on the farm, the pets must be reported. If the pets cause a nuisance or you arrive without pre booking a pet in, the camp owner reserve the right to ask that you take your pet to a local kennel. Please check the information on the location in question. To secure your stay a 50% deposit is required. The balance of the booking amount must paid in full to AfriCamps, at the latest, one month before arrival. In the event of a booking made within one month before arrival the entire booking amount must be paid immediately. In the case of a late or incomplete payment you are in default. AfriCamps will reserve to the right to cancel the booking within immediate effect. You are responsible for all damages which suffer or will suffer as a consequence of this, as well as all costs which AfriCamps has made with regard to your booking and the cancellation. If, after confirmation of your booking, you would like to make some alterations, AfriCamps is not obliged to satisfy these requests. It is at the discretion of AfriCamps whether, and to what extent, these alterations can and will be accepted. We require confirmation in writing of your intention to make any changes to your existing booking. For each modification made to an existing booking, up to a maximum of 1 month before arrival, we will charge an amendment fee of R250. These costs will not be charged if you extend your stay or change to a more expensive period. If you change your stay to a cheaper period the nightly fee will be re-calculated and the R250 amendment fee will apply. Changes within 1 month before arrival are seen as a cancellation and you will be charged 100% of the total booking cost (see cancellation policy). If, after confirmation of the booking you want to reduce the number of booked tents or nights, the cancellation policy will be applicable to the canceled tents or nights. In principle, alterations cannot be permitted less than 1 month prior to arrival. In the event of a cancellation more than a month before arrival, your deposit of 50% will be non-refundable. In the event of cancellation within a month before arrival the entire booking amount is payable to AfriCamps. In the case of premature termination of the stay, the entire booking amount is payable to AfriCamps. In order to make the stay on the farm for all guests as pleasant as possible, we expect all the guests to stick to the general rules of behavior and appearance based on common sense and a basic etiquette. Breaching these regulations can lead to removal from the farm without a refund of the rental sum or a part of it. We would also bring your attention to the fact that it is possible that maintenance activities will be carried out during your stay on the grounds or to the accommodation(s) without you being entitled to any compensation. AfriCamps and the corresponding farm cannot be held responsible for not fulfilling its obligations due to unforeseen circumstances, such as but not limited to bankruptcy, natural disasters, acts of terrorism or serious threats of terrorist attacks, sabotage or piracy, strike or boycott, acts of governments or any other acts of authority whether lawful or unlawful, blockade, siege or sanctions, accidents, fires, explosions, plagues or any event of a similar nature. The guests and those who accompany him or her, are jointly and severally responsible for all loss and/or damage which arises, for AfriCamps, the farm in question and/or any third party as a direct or an indirect consequence of their stay, irrespective of whether this was caused through actions or refraining from actions by themselves or by third parties, who are at the farm through their making, as well as of all damage which is caused by any animal and/or matter which they have under their responsibility. 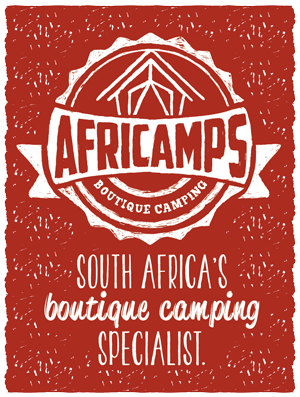 If you leave your tent in an improper condition, AfriCamps is entitled to charge R250, – of additional (cleaning) costs. This can double to R500, – in combination with a late departure. Despite all the care of AfriCamps and the affiliated farms it may occur that you have a complaint. You would need to take up this complaint with the camp owner immediately, in order to allow us to solve the matter as soon as possible. Should the complaint not be settled to your satisfaction, then you have the option, up to 7 days after departure from the farm to lodge the complaint in writing or by email with AfriCamps. Remember that you will be staying on a working farm with live animals and potentially dangerous farm equipment amongst other hazards. Also you must be aware that some of the camp equipment (such as the wood stove) may be dangerous if misused. Whilst we and your host farmers take great care to keep you safe, accidents can happen and neither we nor the farm are responsible for such accidents (to the greatest extent permitted by law). It is your responsibility to supervise any children. If you notice that any equipment looks faulty and/or unsafe you must inform the host farmer as soon as possible. Your contract partner is AfriCamps. These general conditions are applicable to all reservations, directly or indirectly made with AfriCamps. Alterations are reserved on the contents of our publications. Obvious errors do not bind us.